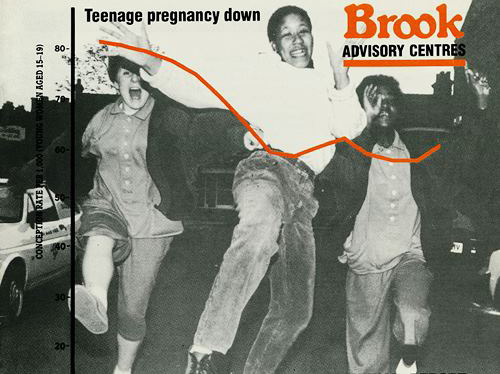 We are delighted to announce a significant addition to the Wellcome Library’s existing important archival holdings on sexual issues and birth control: the archives (SA/BRO) of Brook, the sexual health charity for young people. 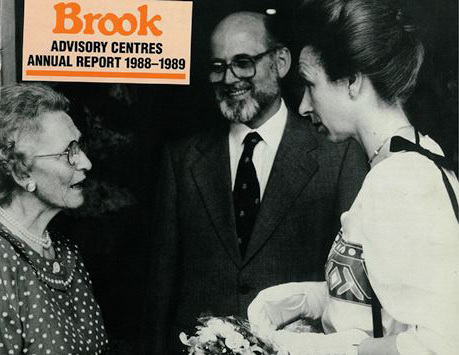 The organisation, which reaches its 50th Anniversary this year, is named after its founder, Helen Brook (1907-1997). In 1958 Brook was asked by the Eugenics Society to run the birth control clinic they had just been bequeathed, rather to their surprise and confusion, by Marie Stopes. As this clinic, unlike the Family Planning Association where Brook had previously worked, was not required to confine its service to married women or women who could prove that they were very shortly to be married, she established a weekly evening clinic providing contraceptive advice and fittings for unmarried women. In 1963 she extended this to include ‘secret’ sessions for young women (at that time mostly students from London University), news of which broke in a storm of publicity later that year. 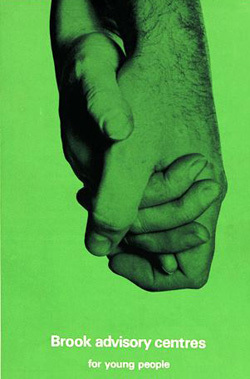 The Board of the Marie Stopes Centre suggested that it would be advisable for Brook to set up a separate operation to deal with this controversial initiative and in 1964 the first Brook Centre opened in London, exclusively for young unmarried people. A number of similar initiatives were being established at around the same time: for example, the small group of Helen Brook’s own papers which form part of the archive include a file of correspondence with the contemporaneous Harlow Advisory Centre for the Young (SA/BRO/J/1/3). 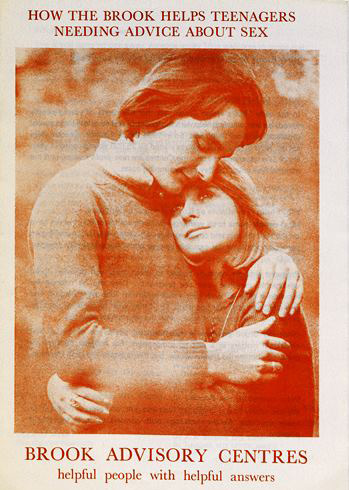 There was a considerable concern at this period around young people and sexual activity in the light of rates of unmarried pregnancy (although ‘teenage mothers’ constituted a tiny percentage) and increases in STDs among this section of the population. 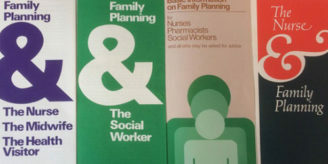 The work of the Centre was facilitated by the 1967 Edwin Brooke Family Planning Act which enabled, but did not require, local authorities to provide free contraception without reference to marital status. The passage of the Abortion Law Reform Act in the same year also made it possible for Brook legally to advise and arrange terminations. Although from 1970 the FPA began providing its services to the unmarried, Brook retained its niche of a specific mission to the young, who were unlikely to resort to clinics aimed at an older clientele. Over the decades Brook has increasingly extended its services to include a broader agenda of sexual health beyond the simple provision of birth control, including targeting young men as well as young women. A number of local and regional centres were established in various parts of the UK. Brook strongly emphasised the confidentiality of their services, a promise threatened when a GP in Birmingham, whom the clinic had informed about their prescription of the Pill to one of his patients, immediately told her family. Further problems for the Centres were created by the publication of sensationalist articles in The News of the World, subsequently made into the book Babies for Burning, alleging widespread abuses relating to abortion provision including false diagnosis of pregnancy. While the spuriousness, and indeed, downright factitious nature, of its claims was eventually established by the Sunday Times ‘Insights’ team, this caused significant problems to British voluntary bodies in the field of reproductive control during the 1970s. In spite of these setbacks, Brook was making substantial progress and gaining government support for its mission. Another high-profile case which had an impact on its operation was when Mrs Victoria Gillick sought a court ruling against the prescription of birth control to under-16s, initially succeeding in gaining such a judgement from the Appeal Court, but this was eventually overturned by the House of Lords. It nonetheless had a deleterious knock-on effect on this vulnerable group seeking contraception. However, Brook continued to gain good publicity and establish solid relationships with central and local government authorities; the Guest of Honour at its 25th Anniversary in 1989 was the Princess Royal. They continued to develop innovative means of promoting sexual health among young people, including introducing a free phone helpline in 1991, a website in 2000, and a confidential online enquiry service in 2002, as well as constantly developing their educational and publishing programmes. Helen Brook (left) with the Princess Royal at the 25th Anniversary of Brook Centres. 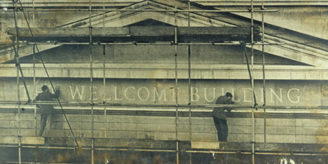 Author: Dr Lesley Hall is a Senior Archivist at the Wellcome Library.